North Carolina Space Grant is pleased to announce the release of three funding opportunities for the 2018-2019 academic year. Community college students, undergraduates studying STEM education, and student-led design teams participating in interdisciplinary research projects in STEM disciplines are invited to submit proposals for funding. NC Space Grant is offering a competitive scholarship opportunity for community college students majoring in science, technology, engineering or math (STEM) disciplines at any campus in the NC Community College System. The Community College STEM Scholarship award provides second-year students with a $1,000 scholarship, based on academic merit and potential for successful matriculation into a four-year degree program. The goal of the STEM Pre-Service Teacher Education Scholarship is for students enrolled in STEM-related teacher-education degree programs at the undergraduate level. They are considered pre-service teachers. Scholarship recipients will complete a series of NASA STEM Digital Badges, participate in professional-development seminars and attend an expenses-paid field trip to NASA Langley Research Center with their fellow scholarship recipients. The scholarship provides $4,000 of support to equip future teachers with NASA content and tools to improve perceptions, understanding and interest in science in their future classrooms. NC Space Grant will fund interdisciplinary, student-led research projects in STEM disciplines that provide unique student-team design experiences in national competition either sponsored or sanctioned by NASA or another STEM-related organization. This award provides students with $5,000 per team to design and build projects to participate in these competitions. In 2018, teams supported by NC Space Grant teams participated in a range of robotics, rocketry, unmanned systems and other competitions – many carrying away awards and accolades for their innovative projects. 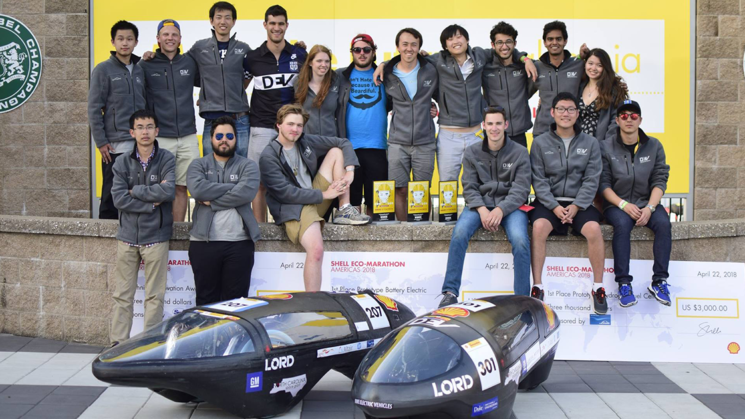 One team, Duke Electric Vehicles, earned two first-place awards in the Shell Eco-Marathon Americas competition with their electric and hydrogen fuel-cell vehicles. They also earned a Technical Innovation Award for their hydrogen fuel-cell research and development. Inspired to seek the next challenge, the team further improved their winning hydrogen fuel-cell vehicle design and broke the Guinness World Record for fuel efficiency. For a full list of NC Space Grant’s annual funding opportunities, visit the Higher Education Opportunities page.